My well-intentioned plans to be a more regular blogger and 'podder' have, inevitably, been thwarted by pressures of work and the joyful circumstances of return of son for the first time since starting university. So, quite a lot to report, including and especially a further return to my old school and more 'school-friends reunited.' But first, I must note another enjoyable appearance on Rob Mcloughlin's City Talk programme, 'edited highlights' from which can be found on my Podcast site. The main reason or justification for the two 'live' guest on the programme is to review the Sunday 'papers – but that week's programme was notable for the absence of a vital element in this. Can you guess what it is yet? "I suppose you'll be putting all this in your Blog," noted Rob ruefully. As if! Rob is also the presenter of Granada's weekly political programme Party People, which he tells me will be the last series ever in a tradition of such programmes dating back to 1956 when it was presented by Robin Day. Another end of an era. The following week one of my colleagues invited Gerrie Byrne, Rob's producer on Party People in for a talk and some 'careers advice' to final year students. The week after this our journalism department had a had a visit from Steve Boulton, who gave a refreshingly frank and un-pompous talk about his journalistic career, including work on Granada TV's networked legendary World In Action programme. 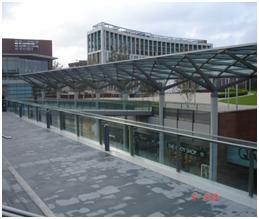 …and these show the landscaped feature of the centre, with fountains and lots of green space and part of the overhead walkway, going down to John Lewis's. 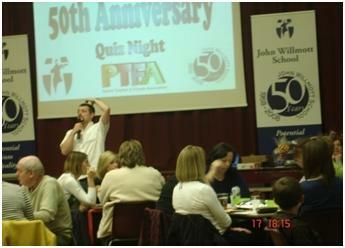 Just under two weeks later and it was back to the future with my old school's golden jubilee PTFA quiz night in which current and former staff and pupils were invited to pitch their wits in a quiz covering the 1960s-'90s. BEFORE ANY MORE ON THIS – AND ESPECIALLY FOR OVERSEAS READERS – A QUICK HISTORY LESSON! The grammar schools were part of the post-war dream of a meritocratic Britain. In the 1944 Education Act, all education authorities were ordered to test children to gauge their innate intelligence and intellectual capacities, in an exam called the 11 Plus. Harold Wilson was Prime Minister in the heady days of the late 1960s when we started at the school;– the first Grammar School - educated PM and, in fact, all Prime Minsister who won general elections from 1964-1997 were grammar-school educated and who, like my Dad, had won a scholarship to a grammar school. In the post-war world though, unlike my Dad, if you were bright you did not have to go cap in hand for the money to pay the school fees, uniform, etc. but would get a 'free' education which was designed to be as good as that at the private schools – and with much the same ethos, of hard work and strong discipline (see below). Pupils would be judged by their merit and ability, rather than their back-ground and, with such a supposedly objective test to determine which school you went to, if you ended up in a less academically-focussed school and consequently had a more menial, manual job rather than in the professions or management, that was because you weren't capable of anything else! In short, the grammar schools tended to not only consolidate but legitimise social and economic differences and expectations. It was quickly realised that in fact whilst there are undoubtedly differences in genetic intelligence and other abilities, these differences tend to be magnified and re-enforced by one's home environment. Shortly after the grammar-school educated Wilson came to power, a famous or infamous memo to Whitehall (10/65) was circulated by the privately and Oxford-educated Secretary of State for Education and Science, Tony Crosland, who was, according to his widow, determined to 'close every f*&%!" grammar school…"
As Nick Cohen has argued though, whatever the injustices and unfortunate effects of dividing children into 'sheep and goats' aged eleven, social mobility of our generation was far greater than today's and the fact is that the grammar schools DID work for a significant number of people in providing them with life opportunities. It is one of those issues that (unusually for me) I have changed my opinions about a number of times – and my own son went to a Comprehensive School, regarded as one of the great success stories of the sector. I've chronicled in previous blogs the surprisingly powerful effect that returning to the school and the town had on me back in July and the wonderfully re-forged friendships and I was hugely looking forward to the next opportunuity. Five of us got together to form the 'Still Crazy After All These Beers' team. What a change from when we were last all together and today. I mean, in 1973, there was an unpopular Republican President in the USA, trying to extricate himself from a very unpopular war, there was a major economic crisis looking at home, Bruce Forsythe and Doctor Who dominated Saturday night television, Terry Wogan was doing the breakfast show on Radio 2…oh, hang on! I drove down late morning and one of my old mates took me to lunch at a restaurant overlooking Sutton Park – which has some many great memories. On the way there I answered a call from another former class-mate (and one who had been a huge hit with the girls!) who I hadn't seen or spoken to for some 35 years. Later, we picked up him up in the taxi on the way to the quiz and then at a pub near the school met up with the other main friend reunited from July and another lad from our year, who was one of one of the most successful at sport of our school era and still has an enviably lithe figure! Obviously, we had a lot of catching up to do! We got on really well - more than a third of the century had passed since we were all together . I suppose it isn't so surprising that if you get on with people at 15 you will at 51, but stilI…it was a special evening, which continued well after the quiz (in which, I should record, we came fourth out of 24 teams - which we all agreed was the best we had ever achieved at the school! 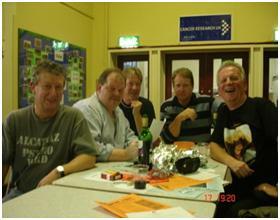 We played our 'joker' for 1970s music and managed to get ten out of ten for that-so, unfortunately, did most of the other teams! These questions sparked a lot of animated conversation about the music we liked then-and still do. Now, because the three of us had been back in July, returning to the school this time this didn't have the same emotional impact - for me at any rate. But for the other two it was evidently the first time they had been back since leaving at 16. "Hmmm…the last time I came out of that office Kenny France (the headmaster) had just caned me!" said one. This was followed by a spontaneous cry of: "Assume the position!" (the instruction from the master about to do the caning or 'slippering') and a flood of anecdotes about various beatings we had endured. I've discussed in the previous Blogs some of my experiences and thoughts on this aspect of school life – which obviously left its impression with them as it had with me but, most, like me, hadn't been traumatised by it or regarded it in the way that it would be considered today-it was just part of school life. There may even have been a bit of one-upmanship still after all these years because, you see, the number and severity of beatings you had –and the fact you showed you could 'take it' – was an indicator of how tough you and 'bad' you were– with a caning from the headmaster being I suppose our equivalent of an ASBO and gratifyingly severe marks left by the cane on the back-side to show off afterwards to the peer group. High-spirited 'japes' would often be 'rewarded' by physical punishment from the masters and I certainly saw it as an affirmation that I was – or could be – something approaching what my Grandad would have called 'a proper lad'. It all sounds a bit odd now but you have to remember that corporal punishment was deeply embedded in our culture. The BBC had a sit-com called Whack-O! ('whack' being the slang for a caning) which originally ran the 1950s and '60s but was revived in the early 1970s while we were at school. It is astonishing to think that what we would now regard as child abuse was regarded as tip-top family entertainment. There was even a movie adaptation, which often played on TV, called Bottoms Up! This includes a 'mass execution' where a super-long cane is hoisted onto a special device for simultaneous thrashing of the whole school. Yes, this really was considered hilarious! The star of this show was Jimmy Edwards – who, as it happens, served in the RAF with my Dad. Edwards was a complex man, he had married but in the 1970s 'came out' and after that the work dried up—which he blamed on a homophobic attitude (although I doubt he used that word). More likely, his association with such dubious characters and situations were out of keeping as the 1970s progressed. In books, too, such as Jennings and Derbishire and the earlier setting of Thomas Hughes's Tom Brown's Schooldays and the acclaimed 1971 BBC TV adaptation right in the middle of my Grammar School days, certainly inculcated with me the idea that such punishments were paper for the course for school-boys. A more jaundiced, or 'anti caning' television portrayal was in an episode Taggart which is set after corporal punishment was made illegal and the headmaster 'loses it'. The reaction and horror of the boys can be contrasted with the more phlegmatic response of my generation. Of course, the psycho-sexual 'issues' of being beaten in that particular area, the whole submissive posture and power thing form adult to child is, to say the least, a little unhealthy. Against that, I found the beating on the hands, shown in such movies as Kes which came out about the same time and showed school-life in a (to say the least) somewhat different environment, I thought was far more horrific. I mean, the hand is a delicate and complicated construction and it's what I wrote with, whereas your back-sides are essentially just two muscles and to most schoolboys is intrinsically 'rude' and hilarious (this also applies to males a lot older judging from the hilarity of 'mooning', photocopying of arses, etc.) . The reminiscences punctuated the rounds of the quiz. My contribution to the scores was pretty negligible , partly due to the fact I was with some very bright blokes but also because I kept having flash-backs and visualised us all as we were in the early 1970s, which I do find touching. As is clear form previous Blogs I get pretty sentimental-although the tear ducts didn't spring into action until later at our second pub visit and I was talking to one of their wives about how much it has meant to me to be back in touch with them - in one case being like long-lost brothers. I was just beaming at them, thinking how good it is that five 'kids' who all left school at 16 and (I hope I am not doing anyone an injustice) were not regarded as 'high flyers'; have all in different ways done pretty well- and certainly we have all worked very hard and the other four set up their own businesses and generally been very enterprising. How much the school had to do with instilling a strong work ethic is hard to know. After the quiz and the pub(s), there was more red wine and more chat back at the home with this mate and late to bed…then coffee next day with another one of the team in Cost Coffee, which allowed for more riffing along the lines of: "Who'd ever have thought when were at school, we'd be sitting here today…", a la Monty Python's Four Yorkshiremen. As far as most of 'our gang' was concerned there were clearly a lot of happy memories of our school-days, many of them to do with standard adolescent frustrations and embarrassments –as well as the odd success! One of the team though – despite having good memories of us doing' 'stuff' outside the school, found the whole experience traumatic and thought the physical punishments akin to 'torture.' We've had long chats since about whether our fond memories of these days was tinted-or tainted-by nostalgia (certainly, to some extent) and whether our individual memories are affected by the collective recall and influenced by others' opinions and recollections – almost certainly. But, on the other hand, I do (as all proper academics should) make reference to primary sources-i.e. my diaries (! ), which I faithfully kept for most of the period and recorded all those incidents and episodes of emerging from childhood into adolescence (rather later than did my companions as I recall!) and, although there are certainly plenty of bad 'episodes', there is a lot of good stuff in there, too-mostly, to be fair, linked either to my drama activities in the school, or outside of it and 'hanging out' with my friends outside school. I solemnly awarded each day a star rating from one to five and, certainly in the last two years at school, there were a lot of four and even some five stars. However, I've also got pretty angry about the attitude of the school in other ways and the fact that they didn't really encourage us-in fact they seemed reluctant to offer praise at all. The attitude to children/youths today must, surely, be better? At the same time I do remember a lot of laughter, whereas today youngsters seem so miserable! A spookily semi-biographical novel set in a school not far from us at the same time is Jonathan Coe's The Rotter's Club, brilliantly adapted by the BBC and there is a lot to think about in his follow-up novel, The Closed Circle when the characters meet up again in Berlin in 2003 – which, as it happens, was the year I visited Berlin, with family – the first time wife and I had returned since leaving there in 1984. What's for sure is that this whole reunion thing has been fantastic for me – and the best part of it, I reckon these re-activated friendships are there for life, now. More on all this some day soon but this post is way too long as it is, so it will have to wait. Thanks for your patience, readers! 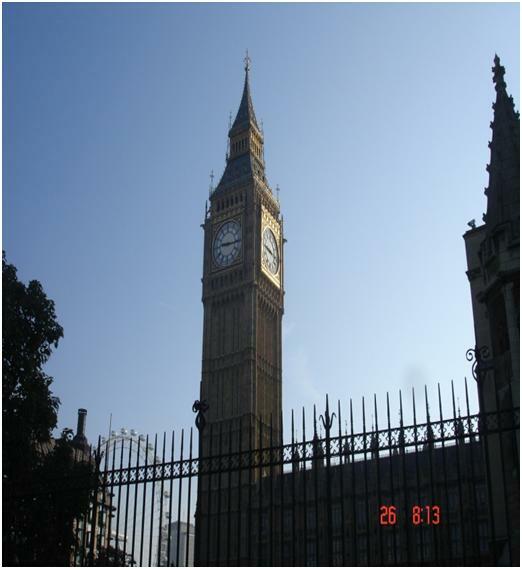 I had an enjoyable and productive visit to London last week. I travelled on the very early morning train, which was staffed by some frustrated entertainers, who were determined that we should have fun! The trip was for the annual seminar to update journalism tutors on changes to public administration -- yes, it really was that exciting! In fact, the risk of appearing irredeemably nerdy, I would enjoy these sessions, not least because there attended by some lively characters, including my own former tutor in this subject from Highbury College in Portsmouth way back in the mid-19 70s! 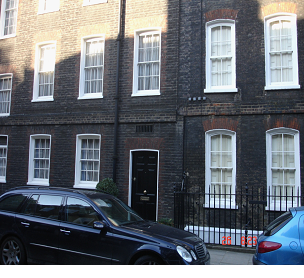 I was not the only one of his former tutees present at this year's seminar -- held at Local Government Association in Smith Square, the former Transport House, (pictured). The whole square is redolent of political dramas of the past. Pictured is Lord North Street, former home of PM Harold Wilson, from where he held court after his retirement in 1976, would tell people- including journalists Penrose and Courtier - about 'dodgy' goings-on, including an apparently serious attempt by sections of the military, in cahoots with the South African secret service, to attempt a coup against the UK government. Try telling the young folk of today just what a desperate place Britain was in the 1970s and and they just don't believe you! 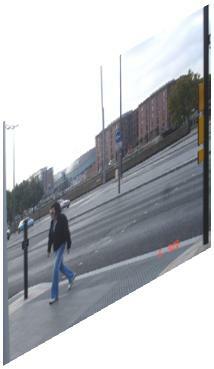 One of the benefits of getting older, of course, is a greater sense of perspective. Although things seem bad at the molmnent I doubt we'll get back to 27% inflation and having to be bailed out by the International Monetary Fund, as we were in the mid-1970s. Mind you, we did seem to have better weather then: the period I was at Highbury - 1975-76 - was book-ended by two of the hottest, driest summers on record – and no-one had even heard of global warming then! Anyhow…! 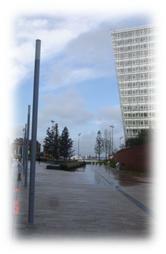 Going back a bit further and the one time home (just around the corner) of campaigning journalist W.T. 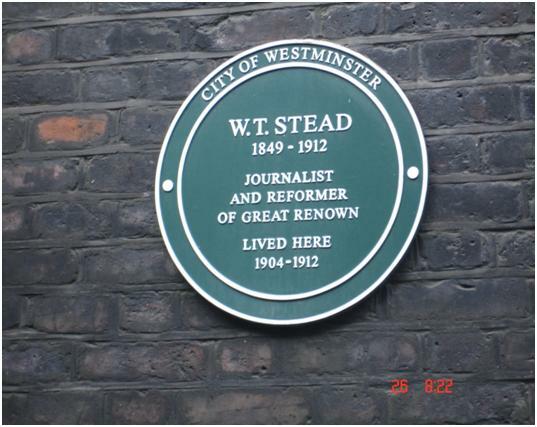 Stead is pictured. He was probably the first campaigning/investigative journliast in the way we undertand them today and his work helped get the law changed – quite an achievement. He reminds me that journalism, for all its intrusions into personal grief, etc., can be a noble, even a heroic occupation: putting wrongs to right, exposing corruptiom giving a voice to the powerless, etc. 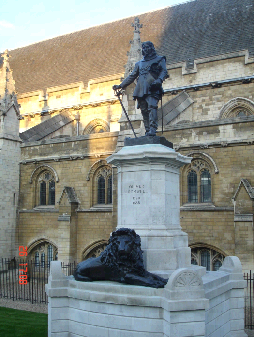 I always enjoy going to be Westminster area, with its extraordinary history and handsome buildings, not least the Palace of Westminster and, in the glorious autumnal sunshine, Parliament and its statues (e.g. Oliver Cromwell-pictured, reminding us that England was once a Republic!) made the whole area around Westminster looked particularly seductive. 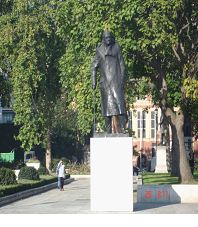 I touched Churchill's statue, as I always do when passing, for good luck -- I think we're going to need it. A lot of people from 'oop north' claim that southerners and Londoners in particular are an unwelcoming lot and too obsessed by their own fast, manic world to bother about anyone else and avoid all I contact on the Tube, etc. I have to say I've have not found this to be the case and on this visit was pleased to see two men, probably in their 30s, separately ask a young woman in callipers (who was Afro-Caribbean as it happens) if she needed any help in negotiating the stairs at Westminster station. I evidently have the sort of face which makes people feel they can ask me questions about locations and directions and which might know the answers! Only being an occasional visitor to London I'm not always able to help but I often can. I at least have a vague concept of the Tube lines and general geography and I was happy to be able to tell a young man -who I think was African French – the way to St Thomas's Hospital. Such small kindnesses do make me feel good. I do believe in that cliché that "a smile can go around the world" and that small acts of humanity raise everybody's morale and general view of humankind.